Information Brochure for UP B.Ed Entrance Exam 2019 has released Now. There will be admission on 2 Lac Seats in 2200 Colleges. Counseling will conduct online. Download UP B.Ed 2019 Information Brochure from link below…. There will be only one Rank this time Read UP JEE B.Ed 2019. From Year 2019, Students can complete their Counseling Process from Home. After Seat Confirmation, he/ she has to appear at counseling centre for Admission. Candidates can upload Documents & Fill Choices Online. Document Verification will also done Online. Admission will be on 2400 B.Ed Colleges. 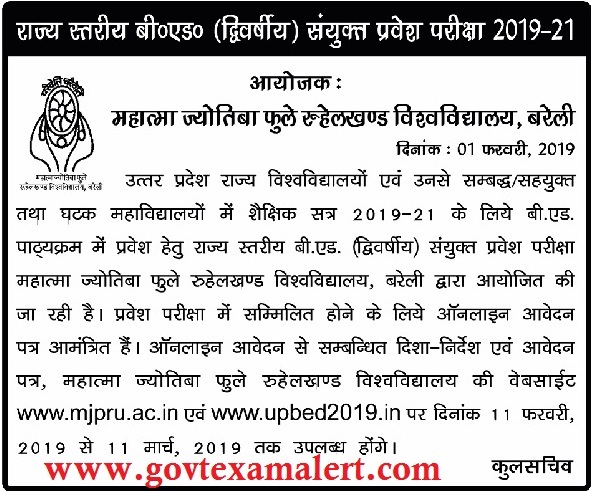 Read Full News from Link given below…..
Rohilkhand University will organize Uttar Pradesh Joint Entrance Examination (JEE B.Ed) 2019. This Exam will be conducted to take admission in Two Year B.Ed Programme. As Per Schedule decided by LU Exam to be organize in the month of May, 2019. Every Year this Entrance Exam conducts for Bachelor of Education (B.Ed) Course in various Government, Private, Aided Colleges. After getting Good Rank in this JEE B.Ed 2019 Exam, Candidates will be able to get Admission in Good & Desired Colleges. Dates of Online Application for JEE B.Ed 2019 will be announced Later on. Students can check Expected Dates of UP B.Ed 2018 Notification, Online Application, Entrance Exam, Result, Counseling below…..Other Details of UP B.Ed 2018 Notification, Eligibility Criteria, Educational Qualification, Application Fee & How to Apply is provided in this Article..
General/ OBC Candidates :- Candidate must have Graduation and/ or Post Graduation OR Degree in Sciences/ Social Science/ Art/ Humanities with 50% Marks. 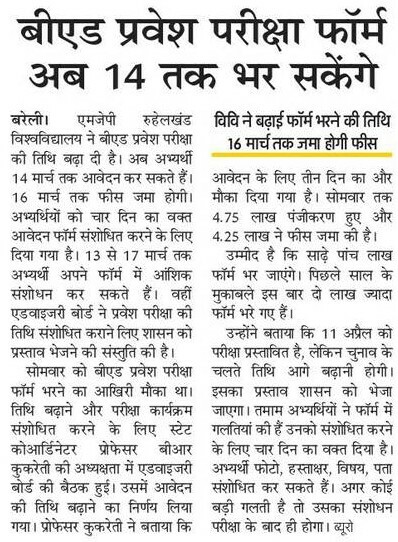 For Candidates who have Specialization of Math & Science in B.E./ B.Tech need to have 55% Marks to fill Application Form. SC/ ST Candidates :- Candidate must have degree of Graduation from recognizing Institute established by Law. NOTE : Visually Handicapped Candidates will be given 5% Relaxation in Educational Qualification Marks. Candidates who are appearing for Eligibility Exam i.e. Final Year of Graduation, will not be able to Fill UP JEE B.Ed 2018 Online Application Form. Application Fee :- Rs. 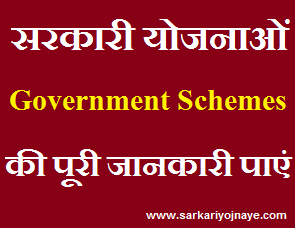 1500/- for General/ OBC Candidates & Rs. 750/- for Candidates belong to SC/ ST. Candidates can pay Application Fee by mean of (Credit Card/ Debit Card/ Internet Banking)/ Payment Gateway Or by Submitting Challan Form in any CBS Branch of Bank. Candidates need to save Filled Application Form & Registration No. for Future Reference.